When it comes to electrical muscle stimulator comparisons, Pain Relief Essentials recommends the Rhythm Touch 2 Way Electrical Muscle Stimulator for use in deep muscle and tissue pain relief. With the longest history of use and with many thousands of customers who have found reduction relief from their pain through the use of this particular machine, we have found most of our users prefer this brand when they need a portable unit. It has optional foot attachments (slippers), an optional acu-roller (move-able electrode), and optional acu-pen (for pin point acu-therapy). 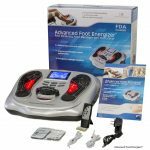 For advanced foot care and leg care we recommend the Advanced Foot Energizer Combination EMS and TENS Foot Massager and Stimulator which provides 25 programmed modes including both EMS and TENS. It also has two separate channels for using electrode pads. This allows you to massage your feet at the same time you are treating two other areas of your body. 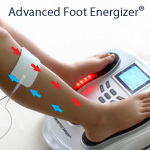 Similar to the Revitive Circulation Booster® which uses E.M.S., the Advanced Foot Energizer™ features both E.M.S. and T.E.N.S. modes for more versatility. Learn more at AdvancedFootEnergizer.com. 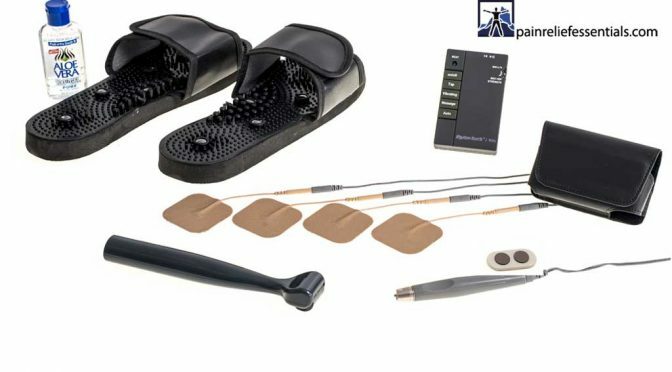 Save 10% on Advanced Foot Energizer, Rhythm Touch Complete Kit and Packages, Electrodes, or Cordless Infrared Therapy. Join newsletter for code. You will find the following electrical muscle stimulator comparison to be a useful guide. Every electrical current provides a different end result and our body responds to each current in different way. T.E.N.S., or Transcutaneous Electrical Neural Stimulators, are designed to block pain signals from getting to the brain. They do this by sending several hundred electrical messages along the nerve fiber at the same time. The high number of messages confuses the brain and allow for the painful area to go unrecognized. After long periods of use the brain has the ability to sift through the many messages and recognize the area of pain in the body once more. You can see why a tens unit stops being effective after periods of use. Russian T.E.N.S. – Russia T.E.N.S. devices were originally developed by the Russian Olympic team for muscle mass enhancement. The high frequency and deep contraction allow for muscle mass enhancement. Russian T.E.N.S. devices are currently not available without a prescription. E.M.S. Electrical Muscle Stimulation, a generic term encompassing all types of electrical current units. Now in the USA the FDA is designating these as Powered Muscle Stimulators. Ab Belts: The currently marketed ab belts all use a low frequency current – the only type current legally available without a prescription. Although these ab belts do not use the higher, more complete muscle contraction of the Russian T.E.N.S., they do a good job of contracting the muscle for a low level workout. Low Frequency E.M.S. Devices are designed to stimulate the muscle, increasing circulation, restoring electrical balance, and reviving the muscle. The lower frequency stimulation isn’t meant specifically for blocking pain or muscle growth, although you will find that pain blockage and enhanced muscle recovery is a byproduct of this therapy. The best-designed low frequency E.M.S. units come as close to the muscle’s natural frequency as possible and will increase the circulation for long periods of time after use. Low Frequency is closer to body’s natural Frequency (2-50 Hertz). This low frequency stimulation is more readily accepted by body and works more naturally with the body’s own systems. Low frequency muscle stimulation does not contract the muscle as completely as a Russian T.E.N.S., but will still bring the muscle to the surface for better appearance. The body responds very favorably to the low frequency. Your nerves will recognize the low frequency current as friendly and will bring circulation and healing to an area. For general use, low frequency devices are much more user friendly. Specific placement of the pads (electrodes) helps the specific body part respond quicker to the current. Because of their low frequency and higher safety, a few devices including the Rhythm Touch are approved for sale without a prescription by the US Food and Drug Administration. Some units offer only TENS, some only EMS, and some offer a combination of both modalities. What you will want to decide on is whether you are looking for only pain blockage or if you want the added benefits that come with EMS. You will also want to look at ease-of-use. There are many types of machines on the market. Some are analog and some are digital. You will want to make sure that you can actually read the information in the display (if digital) and that the system is easy to use. Please read our electrical muscle stimulator comparison to learn how different electrical muscle stimulators relate to the Rhythm Touch 2 Way. *many TENS units come with the suggestion that a technician train you in their use. **TENS units are very powerful and may cause some harm or discomfort with untrained usage. Please be sure to follow instructions for using TENS carefully. ***TENS units use a type of current that sends several messages throughout the body which “scatters” the nerve impulses to the brain. This effectively blocks pain messages coming from a specific area. Once removed the effectiveness is gone. If recommended by a doctor, a TENS unit should be used under their supervision for specific temporary medical conditions. + The Rhythm Touch is approved for non-prescription sale by the US Food and Drug Administration. + The Advanced Foot Energizer is approved for non-prescription sale by the US Food and Drug Administration. Product comparisons are based on user feedback and personal experience and testing. (Transcutaneous Electrical Nerve Stimulators) generally work to block pain by sending “High frequency” continuous electrical pulses through the skin. This effectively blocks the pain signal to the brain from that area of the body. The Rhythm Touch electrical muscle stimulators use “Low frequency” combination of TENS and EMS mild electrical pulses through the skin using the same type of electrodes as regular TENS units, but rather than just blocking the pain signals to the brain the low frequency EMS signals cause the body to release beta endorphin’s… the body’s own natural pain reliever! REVITIVE and Circulation Booster are either registered trademarks or trademarks of ACTEGY LTD. in the United States and/or other countries. DR-HO’S is either a registered trademark or trademarks of DR-HO’S in the United States and/or other countries. Advanced Foot Energizer is either a registered trademark or trademarks of Northwest Essentials, Inc. in the United States and/or other countries. All other trademarks are the property of their respective owners.